Children with post-traumatic stress disorder (PTSD) experience disruptions in the structure of the neural networks inside their brains, according to a study appearing online, October 25, in the journal Radiology. The findings could help in the development of treatments for the disorder, researchers said. These abnormalities suggest that PTSD can be better understood by examining the dysfunction of large-scale spatially distributed neural networks. Children with post-traumatic stress disorder (PTSD) experience disruptions in the structure of the neural networks inside their brains, according to a study appearing online in the journal Radiology. The findings could help in the development of treatments for the disorder, researchers said. Diffusion tensor imaging (DTI), an MRI technique that measures the integrity of the brain’s white matter, was used to look at the brain’s connectome, or the map of the neural connections in the brain. The human connectome includes a series of nodes, or brain regions, linked by connections known as edges. Nodes with a relatively high number of edges are referred to as hubs. 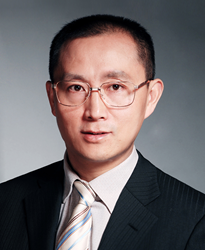 “Generally speaking, the structural connectome and the functional connectome are based on different types of raw images, which may be used to investigate the brain’s abnormalities through different views,” said study lead author Qiyong Gong, M.D., Ph.D., from West China Hospital of Sichuan University in Chengdu, China. “Anatomic Insights into Disrupted Small-World Networks in Pediatric Posttraumatic Stress Disorder.” Collaborating with Dr. Gong were Xueling Suo, M.M., Du Lei, Ph.D., Fuqin Chen, M.Sc., Min Wu, Ph.D., Lei Li, M.D., Ling Sun, M.D., Xiaoli Wei, Ph.D., Hongyan Zhu, M.M., M.Sc., Lingjiang Li, M.D., and Graham J. Kemp, M.A., D.M.